Now that we’re starting a new year, many of us are trying to eat a little bit healthier. At least during the first few weeks so we don’t feel guilty about all the unhealthy stuff we ate the previous year. But eating healthy does not mean that we have to eat unpleasant food without any flavor. 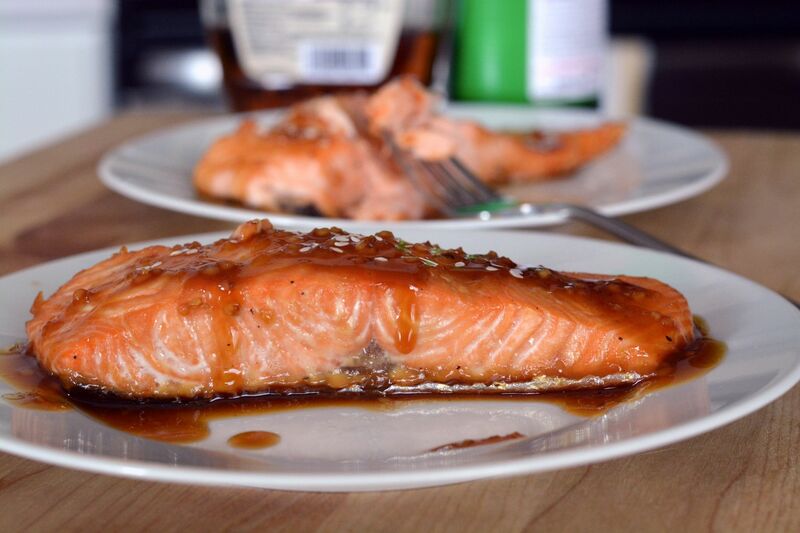 That’s why today I want to share with all of you a delicious way to make salmon, and it’s all in the marinade. Salmon was never a favorite fish of mine and I’m sure it was because I was always given salmon that wasn’t made well, they were too dry or had no seasoning at all. Then, when I became obssesed with sushi and the rolls made with salmon, I completely fell in love with this type of fish. Besides Colombian food, Asian food is one of my favorites, so that’s why I love the marinade we’re using in this recipe. The soy sauce and ginger give this dish an incredible flavor without having to add any kind of unnecessary fat. In a small bowl, mix the first 5 ingredients to make the marinade. Even though the soy sauce adds a lot of flavor, you can add salt and pepper to taste if you think it's necessary. Place the marinade in a resealable plastic bag and add the salmon. Refrigerate for 30 minutes. Pre-heat the oven at 400ºF (204ºC). Take the fillets out of the refrigerator, place them in a baking dish lined with non-stick aluminum foil and baste them with 1-2 tbsp of the marinade. (If you don't have non-stick aluminum foil, you can use regular aluminum foil sprayed with a little bit of olive oil). Let them rest for 15-20 minutes. Bake the salmon for 10 minutes. Baste them again with 1-2 tbsp of the marinade and bake for 10 more minutes. If you want you can reduce the baking time until they are cooked to your liking. While the salmon is in the oven, simmer the marinade in a small saucepan for 5 minutes on low heat. Then, dissolve the cornstarch in the water and add it to the sauce. Keep simmering until it thickens. 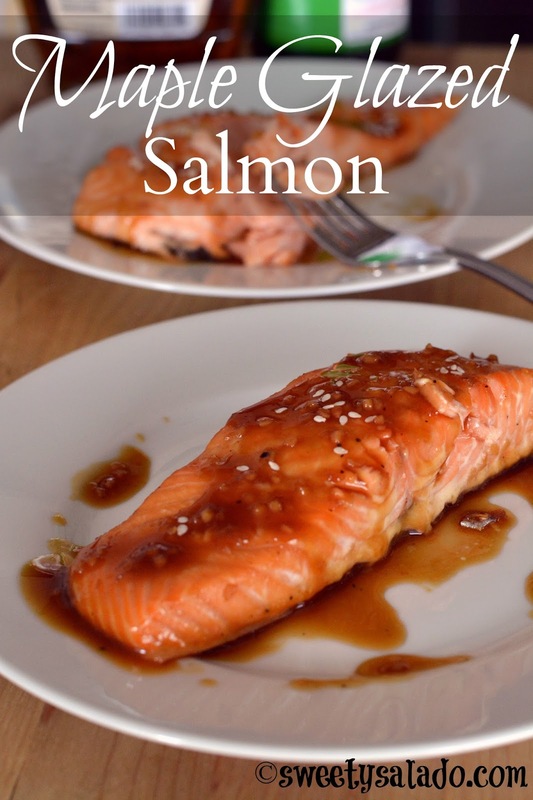 Serve the salmon with a little bit of sauce on top and sprinkle with the sesame seeds for garnishing. 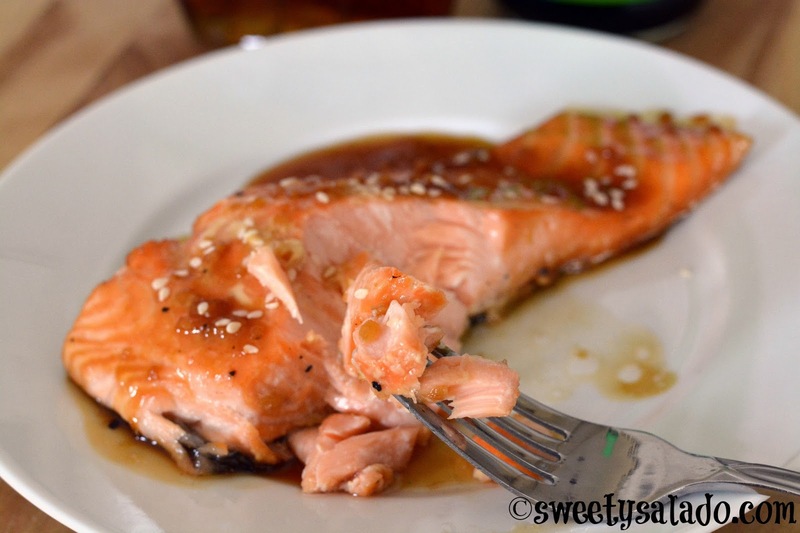 I used this salmon recipe and it was amazing!